What is that little bundle doing in that picuture? He’s looking at his mama. Now I know that doctors say newborns can’t focus their eyes right at first, but I’m not buying it. Steven is looking at me! And he’s waiting for me to look at him. This brings me to the thought of how babies, children, and you and me long for approval. We want to know that someone sees us, cares about us, and loves us. Have you ever been in a grocery store line, behind someone with a baby in the buggy? What is that baby doing? She is looking around, panning the crowd, trying to find someone who will look at her. If you lock eyes with that bundle of love, then she will stare at you until you look away. That baby will stare you down. If that baby could talk, she’d say…Do you see me? Am I important to you? Do you care about me? Do I matter? And isn’t that what we all want to know? Sure, we grow up and learn not to flat out ask that question out loud. But we still ask it in our hearts. So here’s what I want you to know today. If I were sitting with you, I’d look you right in the eye and say it. Here’s a verse I want you to ponder today: “‘Though the mountains be shaken and the hills be removed, yet my unfailing love for you will not be shaken nor my covenent of peace be removed,’ says the LORD, who has compassion on you” (Isaiah 54:10 NIV). And that’s exactly how God feels about you today! On a scale of 1-10, how well do you know that you are loved by God today? Leave me a comment…be honest. I’m going to randomly pick 3 comments and send a free copy of my new book co-written with Gwen Smith and Mary Southerland titled Knowing God by Name. And while you’re at it, how about forwarding this post to a friend who needs to know that God loves her today. Do you long to feel close to God but sense there’s something missing? That you’ve missed that mysterious formula to make it happen? 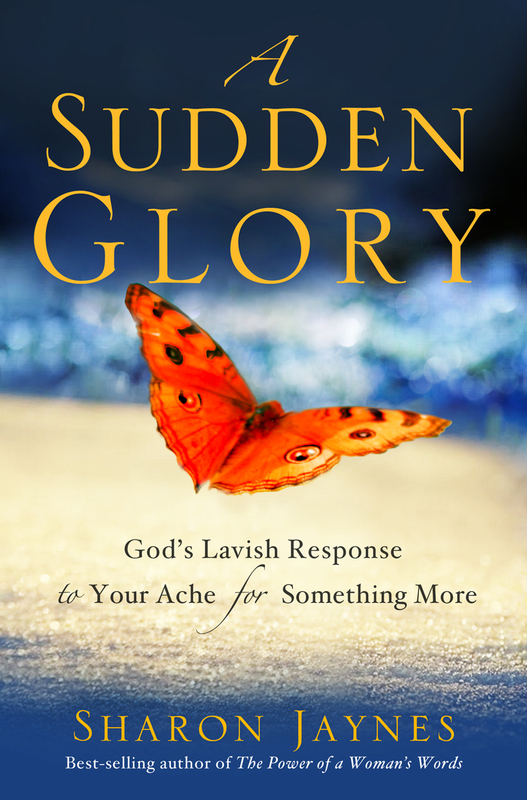 Do have a glory ache – a persistent longing to experience God’s presence and working in your life, but not quite sure how to make it happen? 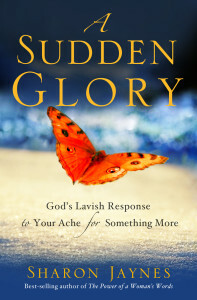 If so, my new book, A Sudden Glory: God’s Lavish Response to Your Ache for Something More, is just for you. Join me and discover how to erase the lines between the secular and the sacred and experience a deeper more intimate relationship with God than ever before. While you’re there, you can download a free chapter or watch a video book trailer. I know God loves me, like the song says, “for the Bible tells me so.” But there are definitely times when I feel unlovable and maybe a 3 on the 1-10 scale. Those are the times when verses like this (and wonderful reminders like yours) are life savers for me. Thanks, Sister, for the encouragement. I know God loves me because He gave His Son so I may live!!!! God is my closest Friend. It is times I feel I do not deserve His love then I open His love letter. “For God so love the world that He gave His Only Begotten Son, that whosoever believe on Him shall not perish but have everlasting life!!!! 5, sometimes I am certain that He does, other times I dont think I am deserving and therefore dont think that He does. I am sorry that you had a fatherly figure tell you that you don’t matter. I imagine that is one the hardest hurts to get over. I am glad that you have forgiven him, now the accomplishment, is not letting his lies rule your output. Just remember that Psalm 139, God created you, and he loves you, and he always sees you, even if it seems no one else does. I will 6 to be honest… Really going through some tough times.. I know the feeling. I know in my head God absolutely loves me but it is hard at times when your struggling. Thanks for sharing. I know I am not alone. Wow How do I feel honestly I feel alone but the truth is “‘Though the mountains be shaken and the hills be removed, yet my unfailing love for you will not be shaken nor my covenent of peace be removed,’ says the LORD, who has compassion on you” (Isaiah 54:10 NIV). God is aking me today I am going to believe it – Yes !! please helo my unbelief. I believe that he’s loves me enough to send his only son to die that i could live. I really needed this devotion. I was feeling really it off sync with God, but this touched me and i prayed through the problem. Thank you. 10 out of 10. Why? because He gave me His only begotten Son to redeem me from all form of sin. Also when i cry unto Him he answers me. Like recently my daughter had been asked to choose from 2 supervisors the one she would like to work with for her dissertation at college, unfortunately there was none she liked but through continous prayers she was allocated the supervisor she wanted. Praise be unto God. 10!!! I am going through a very hard time right now and God is standing with me,with his arm around me. No matter what happens He is right here at my side. Looking at the meaning of compassion and seeing the words “to cherish” just brought a new sense of overwhelming peace – to really grasp that God my creator actually cherishes me is such a humbling humbling thought as my day starts. It gives a new fresh breathe of life in what my day should be about. Oh so thankful! me and shows me every minute of the day! This was a beautiful reminder of how much God loves us. On. a scale of 1-10, I would say 10. Love you Sharon! Thank you for your ministry to women! Sister hugs! 8 – God loves me and I know this because of his provision and his presence in my life. Honestly I would say about 4.I know what the bible says but there is so much that I’m not doing that’s it’s hard to believe that he does. 10 We have gone through some very tragic things this past year and God has shown us time and time again that He is right here with us in the midst of the storms. Anything from a scripture being given to us that God layed on someone’s heart to waking people up and laying us on their hearts to intercede for us before something happened. I have thought many times this past year that wow God must really love us to show us over and over that He is here. We couldn’t have made it this far without Him. Good morning…..10 since He created me and I continue to meditate on Psalm 139. God is God.Shalom. It is in our darkest moments that His light shines the brightest!!! I know how you feel. I was in the hospital last February with three blood clots in my lung from a fall at work. I was back in the hospital in July with cellulitis of the leg. The antibiotics were to strong and I had complete renal failure followed by dialysis. God has healed my kidneys and I no longer take dialysis. Praise God!!! Now I face a total knee replacement. I know God will be with me through this also, just as He is with you during these trials in your life. Just hold on and know He loves you and He always has your best interest at heart. He will get you through !!! On a scale I would say 8. I know God loves me. He shows me His love everyday sometimes in big ways but more ofter in small ways. What I doubt the most is me. Am I good enough for God or do I continually disappoint my God who loves me so much? I love the picture of a baby and their mama ( literally and figuratively). I know God loves me in my head, but the picture of a baby helps me remember that all I need to do is rest in His arms. Dear Sharon, I know that God loves me each and every morning when I awaken from my sleep, breathe in the fresh air, am aware of my surroundings, and recognize that He has afforded me another opportunity to fulfill the plan that He has especially crafted for my life and for His KINGDOM. I know that He loves me because even though I’ve made so many errors in my earthly walk the previous day, He forgives me and He loves me unconditionally without fault. I know He loves me because although I face great challenges daily, I can still put a smile on my face, walk with pep in my step, and embrace a supernatural joy of everlasting hope in my spirit. I’m confident and so very grateful that He loves me. Hi Sharon! I did not realize until I read your post that Steven was looking at you, so precious. I know 100% that God loves me, but sometimes the feeling part of me just wants to feel it more. I am always amazed when I look up from a long weary day and realize that my God waswith me loving me, protecting me, guiding me Me, of all people. Me, who feels so unworthy of such love at times. It brings me to my knees. Thank you Lord! Thank you going through very difficult time and needs to hear that and loved your devotion about our El Shaddai!! Yes! I absolutely know I am loved, cherished, and am important to Him. He does care for me and is very aware of me. Honestly, in this season…as much ad I know I can’t go on feelings, I don’t feel it right now. I know how faithful and loving He is and how in love with me He is. Its just been a hard, long season. I know it is for a reason and trust in His loving hands. You know…I just long for it to be over, just not at the expense of Him finishing His work in me. The Scripture you referenced was so perfect and so timely in helping me stay focussed in remembering just how close He is! Thank you! On a scale if one to ten, I feel at a five. I know God loves me, but sometimes I feel like that love is conditional based on my performance. If I am doing the right things and doing what he wants then He loves me more. I agree completely. I do jail & prison mimistry & I have been impressed for the last few weeks to let the young men I meet know that God still loves them. We see how our family & friends treat us when we fall & think God is the same way, but He loves us with an everlasting love. It never changes & never gives up or gives out. 5 -Struggling with this. I have knowledge that God loves me the Bible says so but I don’t know how he could love me. My heart is aching and I tend to believe the lies of satan over the truths of the word. I don’t see myself worthy of his love and beat myself up over this all the time. God loves me totally, completely and has worked miracles in my life. on may 17, i turned to Him in despair and asked Him to remove my addicition to alcohol. and He did! every day i thank Him and ask for the Holy Spirit to fill me up and He does! i am humble and grateful beyond words to My Lord! I am so thankful that I can say my knowledge of God’s love for me is at least a 9! Whenever you have doubts about His love or aren’t “feeling it”, go throughout the Psalms and see how many times you read about His UNFAILING love! I struggle with God loving me all the time. I believe not having a good earthy father has influenced how I see God the Father. Always asking myself does he really love me how could he? Unconditional love is so hard for me to comprehend. I know comparing God to any person or anything is so wrong because God doesn’t have an opposite! I know how much I love my own children and no matter what they do I’m always here with open arms and love. I try to see God in that way but I still struggle with the fact that how can He love me that much with everything I’ve have done, and keep doing wrong. I guess I would give a rating of about 3. My 4th son is leaving home next week for Liberty University. I know God loves me because even in my sorrow he gives me his wonderful Peace. I,like most people,have my moments of certainty and my moments of doubt. I would probably rate it as a 6 or 7. It is easy to believe it when all is well in your world and more difficult to believe during the dark, cloudy, rainy seasons of life. Funny how the dark seasons make us more conscious of our need for Him. We tend to put him on the back burner when all is going well in our world until the next time we need we need Him. I am learning I need Him every minute of every day. The bright beautiful days are not quite as bright enjoying them alone. Thank you God for loving me every minute of every day !!! 10+! I am sooo much more blessed than I deserve – & the fact that we just finished an AMAZING, OVER-THE-TOP Missions Conference – well, just proves to me that “I am God’s favorite!” Okay – maybe we all are, but, today, right now – Daddy God deserves ALL the praise & glory – & I am tremendously blessed! I am a 9. I know it but I feel that depth of it is beyond what my mind can understand. Knowing I am loved….really loved is priceless! I pray for those posting that are in the lower numbers…I pray you know how much you are loved. In my heart, a 10….but in my head, well that changes. As my relationship deepens, He changes the ways He lets me know that I am loved. And when you go though the changes, you can falter on your thinking. In the beginning, it was all “gushy” love, just like young love. When I had my quiet time with Him, I could just fall in step and “marinate” in His presence. It was amazing the love I felt. He constantly held my hand. Now that the relationship is maturing, there isn’t so much hand holding. It’s to build faith in Him, a good thing during these end times, but sometimes disconcerting none the less. It requires you to really focus to see Him. So, sometimes I just miss the old. For me, it’s easy to press in and really lean on Him in the big trials. It’s the day to day little struggles where i can get lost. 10 In addition, I believe He is El Roi — the God that sees me. I learned this from your devotions, Sharon. Thank you. 🙂 Have a blessed day! I think that knowing God loves you and truly believing it in your soul are totally different things… As a Christian, I know God loves me, but when I felt it in my spirit and in my soul for the first time, it was amazing… When I hear certain worship songs, I can feel his arms around me giving me strength and encouragement. Or, when I see a beautiful sky and think, He painted that for me… God is good. While I know that God loves me at a 10+ every moment of every day, my awareness of his love ranges from one end of the scale to the other. I know that it’s my responsibility to open my eyes, mind, and heart to His love and that is a work in progress. I’m really striving to be more thankfully aware of the blessings in my life, big and small, and when I do that, I am much more conscious of His incredible love. What an awesome God we have who loves us just as we are. Praise the Lord!!!! Despite my failures, and the rejections of this world, I know God’s love for me is a 10!!! Even on the days I try to hid from Him in shame, His love for me is still a perfect 10. Thank you Lord for being my everything. I am just learning about Gods love for me so on a scale of 1-10 I would have to say a 4. As a new believer I so enjoy learning about his love and how he never gives up on me, even when I am at my lowest he seems to be able to make me feel wonderful!! On a scale of 1-10, I would most definitely say a 10! Why do I believe this?! Because God reminds me of His Great Love for me all of the time….. even when I’m going through some very difficult times in my life. “The LORD himself goes before you and will be with you; he will never leave you nor forsake you. Do not be afraid; do not be discouraged.” — Deut. 31:8. 10-I know He loves me because of what He has done, what He is doing, and what He promises to do. He has bought me to this place to confirm His love for me by walking with me while I face the giants in my life and seeking the approval of man is one of them. He confirmed His Word this morning by reminding me that He will never leave me or forsake me. Thank you for today’s reading. I would honestly have to say that for me it’s around a 2-3. I’m not joking. So many disappointments and hardships on my life currently. I’m thankful for my family and friends who have been supportive and offering prayers. I’m struggling. I grateful that I found your website Sharon. Thank you! If I am honest, I would say an 8. I read about how much he loves me all the time in His word and I feel/see it often in my life; but it is hard to balance it when the ways we show love, or don’t show love to each other is so “imperfect.” I have a son that has anxiety and depression to the extend that he is barely living; and I am pleading to God for healing or deliverance out of this situation. It has been going on for over 2 years. He has such a heart for God’s people and wants to return to the mission field. It is very difficult not to fall into believing that God is busy with everyone else and has temporarily taken His eyes off of our situation or let His fingers relax and spread just enough that we have fallen through; what possible good could be coming from allowing him to be disabled to the point that he cannot serve His own people. But I know, deep down in my heart, that God is allowing it for a reason and His ways are perfect! 10 Because everything he has put in my heart to do whether I wanted to or not he has seen me though. He has continually made a way out of no way. I just sincerely desire a closer relationship with him daily. But I know I need to prioritize my life better to make that happen. In seeking a daily devotional I stumbled upon Girlfriends in God. And I have to tell you it has been a tremendous inspiration to me. I know that God loves me, but I sometimes just forget to remember that. I know, not good sentence structure. Going through some really heavy things right now and it is sometimes difficult just to make it through the day. Most of it has to do with other family members that are going through some difficult times, but I’m one of those moms that always wants to fix things, even though my children are grown and have their own families. Then there is my 98 year old mom who is starting a real decline and there is nothing I can do. I give all these problems up to God in prayer, but then I start worrying again when things seem to stay the same. God has always been faithful to me–when I look back, I just have to keep that in mind. Most days I feel like a 5 but lately I would say a 8 or 9. My husband and I are struggling financially but in the last week he has brought the opportunity for new jobs for both of us!! Mine would move me closer to home and cut our gas bill in half plus pay more while his would give him a stable income with benefits 🙂 I need to remember that even when things do not seem so rosy he STILL loves me and wants what is best for me!! I wanted to thank you for this word today. I am at work now but have spent the evening with my father who is dying with cancer. He is in so much pain and it is so hard to see the strongest man I have ever known reduced to being so needy and weak. I am the youngest girl in a family of eight children and my mother is confined to a wheelchair. It is really easy to get lost in the crowd of a very strong family and wonder if anyone sees the way I am hurting and sees the heartache I am suffering from. Not wanting to be selfish we suffer it in silence. I thank you for being obedient and reminding me that God cares and is here to soothe me. from a scale of 1 – 10, it is definitely a 10 and more. He loves me more than I know. If some days I do not feel loved by Him, it is because I have moved away from Him and not Him from me. He is the same yesterday, today and forever. He promises to always be beside us and NEVER leave us. He will always love me. Depending on the day probably an 8-10. When I am wavering He is faithful to bring something into my day to remind me. Sometimes when I need a touch I simply say “Jesus” and just saying His name calms me. I know when I look in the mirror each morning I see a miracle because He brought me back from death’s door in 2001 and now I have been able to see 5 grandchildren born. God is good and faithful and life is good even if it isn’t perfect. I know that God loves me because he sent his only son to die for me so that I might have everlasting life! God is so good all the time! He loves me unconditionally! Wow!!! I love your posts. It helps to deal with the waiting process. 10, I have spent the last 22 months drawing closer to God and finding my worth..in HIS eyes..many things I question, but God’s love for me I don’t. But with saying that, I will share that I struggle with trusting that HE is in control, I still battle trying to change the things I can’t change or worry over the future. But moment by moment I lay things at His feet and trust HIS way. But I know that I know,….that I know HE LOVES ME ENDLESSLY!! God is so many things. I long to know each part of Him in greater detail! Honestly, about a 5. I know God loves me cause he sent Jesus to die on the cross for me, so I believe it, but I don’t always feel it. I know salvation is about believing, not feelings, but sometimes, I’d really like to feel like someone else cares. Our family was never very affectionate, and didn’t give compliments very easily, but was strong on discipline, so I grew up feeling like I had to be good to be loved, so it was more of a conditional love. I know that God loves us unconditionally, but I’ve just been learning that in the past few years. I’m so glad that HE does!! Let’s see….today I know that God loves me on about a 7. Today. Not so every day. I know that it is NOT Him but me, but even knowing that I still do not feel every day that I am loved and cherished by God. I know that I am not to go by my feelings but by the truth, and it does help to get back to the Word and ask Him to help my feelings and any unbelief. In my heart I know that God loves me but sometimes in my head and in my daily life, I tend to forget this fact. I get so caught up in the business of living life and what it throws at you that some how I tend to forget this important truth. You quoted a verse from Isaiah that I have memorized and say a lot because it is the truth. When my world is being shaken, I go to that verse and I am reminded that God’s love can never be shaken and that He loves us with an unconditional, unshakeable, awesome, over the top love. Thank you for the reminder that I so desperately need on days like today. I know God loves me (10). Every bit of the Bible tells me that. It’s getting it from head knowledge to heart knowledge that is hard. I want my relationship with the Lord to be experiential. I’ve learned I can’t base it on my feelings. I’m a newbie to your blog and to accepting Jesus as my Lord and Savior. I would say that I mentally know he loves me at a 7, but in my heart it may be a 5. I’m struggling with getting the feeling that he is present and that He loves me even though I know he does I’ve just been hurt so much in life that I have a hard time understanding God’s love for me and I’m eager and hungry to learn about His love so that I can be certain at a 10 that I am God’s Beloved! Welcome to the family. One of the most powerful things we can learn as a christian is to not be lead by what we feel, but by the truth in God’s Word. God tells the truth! We just need to believe him. Here’s what I remind myself of every day. We don’t feel our way in to right believing. We believe ourselves in to right feelings. I would say about a 4. I know God loves me but sometimes He seems so far away. What my mind knows doesn’t translate to how I live. Thank you for this message. My fiance and I have been ministering to a friend that seems to be struggling with this. I’m new to my faith walk even though I’ve always believed in God, but our friend is a long time Christian. He is constantly looking for validation from others. I’ll definitely share this with him, even though he is a man, it’s a great message that I hope will help him. As for me, I know God loves me and I see it in all the little blessings, but sometimes trials can make me wonder. My initial reaction was to say a 3-4, but I think honestly it’s more of a 6-7 if I ponder it for a minute or two. I’m certain it’ll get stronger as I become more confident in Him through my walk. I read your beautiful writings and enjoy! A blessing indeed. While I’m not requesting the book giveaway, I had already thought about the question you asked response to. While I accepted Jesus as my SAVIOR at age 4,(and yes I do remember where, who and the story that day about a missionary’s faith I didn’t want to miss out on) I believed on and prayed. The way I grew up made me believe I wasn’t worthy or deserved anything good. God have me a beautiful grandmother who while lived far away, made it known to me how she loved me and later another Godly woman who showed me I was valued and cared. They were instrumental in saving my life and showing me what a godly woman was. While I refused to play the role of the victim of events from the span of my whole life I pursued comfort knowing to praise in ALL situations for it is for my good to grow my faith. But I still knew I was not loved and didn’t see how God truly loves me. Until one evening in one of the most painful times in my life. Life as I knew it was over; never to be the same. As I laid one my living room and told God I have a huge whole in my heart and I needed Him to heal it; fill it with Him because filling it with anything else would bring more pain. Then God showed me all the holes from a little girl to present……..it was point of surrender I had never known. Realized all the luggage I really had carried and still hurt, surrendered for filling with Christ and opened my eyes to all this beauty KNOWING how He sees me as the most precious princess/royalty!! I have a peace that traced back to very moment of deep heartache. That moment in time is forever engraved on my heart, mind and soul as the moment I knew/learned how well I’m loved by my Heavenly Father. Thank you for your encouraging words—as usual you(and Mary and Gwen) bring a smile to my heart and a deeper love of the Lord. An 11!! It’s what gets me through the day. Things may not always go my way, but it is God’s plan that I desire so I have complete trust in him. 5……I am learning to accept that He loves me but I struggle with the unconditional aspect of it. I was brought up in a Christian home as a PK; however, my earthly father withheld his love when he felt we weren’t living up to his standards. It has been difficult as an adult not to put his “face” on my Heavenly Father. I know that God loves me for each and everyday He awakens me and grants me new mercy & love. I had been seeking God for a deliverance in my life for quite some time, didn’t know exactly what it was, but I knew I needed God to do a work in my life. I attended a women’s conference & the Lord met me there. The enemy wanted me to feel as though I did not belong among these women of God, but God proved otherwise, He rebuked the spirit of rejection and intimidation and showed His love on me the entire weekend through His preached Word and in prophetic declaration over my life. I know God Loves me, because the more I pursue after Him, the more He answers my cries. I KNOW God loves me…but…there is always that little voice (not His) in the back of my mind that asks “Does He really love ME?” “Will He leave me if I don’t measure up?” — intellectually, I’m aware that this is due to the relationship with my earthly father…this is why, at 51, I start therapy today. I am terrified of what this will bring in terms of stirring things up…I’ve worked hard for a very long time to bury this stuff. But burying it is destructive so time to face the giants. Say a prayer for me, will you? Thank you! And thank you for the “eye to eye” conversation in today’s blog! Each morning when I spend my time with the Lord, I am “blown away” by His love, mercy and grace He gives to me. To know that He loves me, chose me, and sees me through the covering of Christ’s atoning blood causes me to ask the question, “why me?” I can’t answer that on this side of heaven except that His love for me pleases Him and glorifies Him. Thank you for your words of encouragement. I do know that my Lord loves me! And He loves you too! Knowing that He loves me is what keeps me going even though the skies are gray. I definitely believe that God’s love for me is a 10 because I believe in His infallible Word which says in John 3:16 “For God loved the world so much that he gave his one and only Son, so that everyone who believes in him will not perish but have eternal life. Sometimes, I am the problem and have to refer to His Word to be reminded and encouraged. His Word always does what it’s suppose to do. Thank you, Sharon, for your continuous encouragement! From a logical standpoint, I know GOD loves me because of what his word says and what HE has done on the cross. Therefore that level of knowing is a 10. However, when I go deeper inside myself I do not feel that I am lovable to that extent. I feel unloved because I am so undeserving of it which rates my knowing a 2 and many times all the way to zero. Sometimes my circumstances make it difficult to believe in the truth. There are times when I feel alone. I am searching for that connection with GOD that would soothe my soul and gratify my spirit but I just can’t seem to connect. I know that it isn’t HIS failure but mine. I just can’t seem to find the solution to get beyond this to get connected again. Today I feel God’s love at a 8, but I’m learning it’s in the tough times that we look for reminders of God’s love more often and I want to remember to see and feel God’s love in the simple everyday times too! I want to be so in tune with what He is doing in my life that I don’t just see and hear the mighty things he does, but I hear Him when he whispers love into my ear! I want to always feel the 10 of God’s love in my life! It’s funny that you would post this right now. Currently, with our ladies in my church, we are doing a Bible study that has to do with finding our “worth”. We’re learning that our worth and significance come from God, not the world. On the scale form 1-10, I would have to say that I’m around a 6. But, I’m encouraged that I’m learning to know that God really is the “God that sees me” – little ole me! Wow! to know the creator of the universe cares about me is beyond comprehension. Love learning more about it. In my head, a 10! I know this! However, my heart has a hard time, and I would say it would rate that a 1. I am almost 34, and have had 5-6 miscarriages. I have suffered much depression over this because my biggest hope and dream in life was to be a mother. I have prayed and prayed and prayed, and I am still barren and empty armed. I struggle with friendships, jobs, keeping house, etc. I feel very worthless and unvalued in this world and await the day I can meet my babies in heaven! You wanted honesty, you got it! Although at times I have felt that God must not think very much of me because of my faults and self absorption, I know in my heart the He love me more than anyone on Earth ever could. I know His love is unconditional, everlasting and pure. He tells me that He will NEVER leave me nor forsake me and I believe Him. I can see His love for me and for all of us in what He does for us, provides for us each and every day. In my heart, I know God loves me and will work all this out for my good, but most days I feel that I would be the one sheep He would not bother to look for or the one person that He would not notice was missing if I died. It is very hard to remember how important you are to God when your parents have both disowned you. How can you understand anything about his Fatherhood? I know God’s love for me is a 10 but I fail to understand what this means when my dad used to abuse me and is now dead and my own mother, who I have tried to make love me, despite her leaving me with my dad when she left him when I was 6, has now told me she never wants to see me again or talk to me. We do communicate by e-mail but I feel I can’t be as open with her as I was before. Does God understand all this? To be honest there are many times when I felt as if no one loves me….And often felt as if I was unappreciated and unloved by the children that I gave birth to and raised. Being a mother and a mother alone is one of the hardest task in life. I felt as if life was unfair, but in the reading of Gods word and noticing His unfailing love for His people. He let me know that His love was never ending, unfailing and full of grace and forgiveness. I say forgiveness because a lot of times we struggle with loving ourselves because of past and present failures in our lives. But God with His love forgives always,all we have to do is believe and obey, keep the faith and believe. So now when that old feeling of not being loved or appreciated tries to invade my mind. I remember the promises of God and His undying love for me. He loved me first before I even knew how to love myself, God has shown me in many ways that He is truly Sovereign. In 07 I almost died in a serious auto accident, car destroyed I hit a highway divider head on going 60 an hour on the freeway because I was cut off by a phantom driver who was never found. God had a plan for me because I am still here, That alone is love. He has a plan, He made a promise and He protected me and kept His promise. He showed me there is purpose to my life…That to me is the love of God. I’m so thankful for God forever poking me and prodding me toward Him. My safest and secure feeling comes when I am closest to The Lord, deep in His word, searching for meaning. Thank you for being a part of His tug on my heart! Too often I forget that God’s love for me is not dependent on my character and behavior but His perfect holy love. I look too often at my unworthiness and not as often to His heart for me. I needed this reminder today. Today I know that I am loved and cared for by God! An absolute 10. On the scale of 1 – 10, I am somewhere between 9 and 10. I have just returned from my radiation appointment this morning. Quite honestly, I woke up feeling so lonely. I am not alone. God is always with me, but being a widow at 69 sometimes leaves me wishing for someone to be God with skin on to just hold me and cherish me. That is why I told the radiation techs that I am tired of being strong. Guess this is the time for me to turn it all over to Him, and let Him hold and cherish me! 8…I struggle with this often. First thought was 10 out of 10 because I know God loves me and is always beside me even when I mess up. He is an awesome God, and continues to show me mercy and grace, although I feel undeserving. If I had been asked this question earlier today to rate on a scale of 1-10 How well do I know I am loved by God Today – I’d have given it a 5 or 6. I wasn’t feeling very close to God this morning. I felt that I was responding more out of habit than truely opening my heart to God. After reading your post today and your comments about God Loves Me, God Cares about Me, God Sees Me, I am important to Him! These statement made my heart swell with love and my rating changed to 10 – God Loves ME and God Loves YOU! 5, That number has gone up in the last few weeks, my husband and I have finally put God first in our marriage and we are on our road to rebuilding. Sometimes I don’t feel like I deserve his love after shutting him out for so long as an adult. I feel him working in our life and can’t wait until I can shout from the rooftops that my number is now a 10! What I know and how I feel are not always the same – so while intellectually, I would say a 10, sometimes I feel more like a 2. Today, I’d say 8. Thanks for your posts, Sharon, I really enjoy reading what you have to say. Really like your example again, this time. I agree with you I think some babies can see better than what the Dr.’s think. 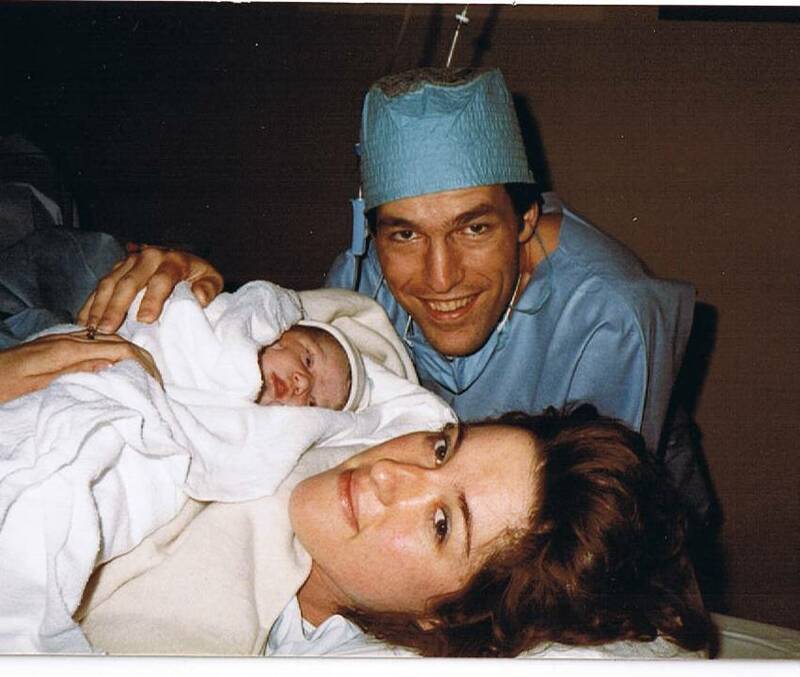 My son had his eyes wide open the moment he was born, he locked eyes with Dad, Grandma and me. That boy has been curious about this world from the moment he was born. I am so thankful for his input on how he views life. I think that God uses children especially are own to remind us how much he does love us. I know God has for me countless times. When my son is laughing I am laughing with him very much enjoying the moment God will whisper, “how much you are loving and enjoying this moment, I am enjoying and loving this so much more.” If I would put this on a scale with how much I know God loves me it would a 10. Hope everyone has a great rest of the day. I know God Loves me because when I can’t, he will. At times when I feel the loneliest I hear a song or read a verse that I just happen to come upon, or someone randomly say’s something to me to remind me of God’s Love, that’s God’s way of saying, I’m here and I’m with you always I’ll never abandon you. I’ve lost two children one was 14 and the other one was 20, both died unexpectedly in car accidents, I ask myself what am I to learn from these tragedies, I know God has a reason for everything. Everyone around me, when I lost my 2nd son thought I would just go insane, me too, but God held me together, he still does. I still have questions, fears, many fears, and doubts. It’s been a hard test of my faith and strength, but songs of worship and books I read are what encourage me to go on and live. 10! I know God loves me no matter what. When I experience trials in my life, it’s just God trying to teach me something, to draw closer to him, because he has something better in mind. 10 of 10. Some days I feel that I disappoint my heavenly father. BUT I believe His word and find peace & comfort knowing how very much he loves me. No matter what. What a beautiful verse. I needed that today and am going to share with friends. I am going say 8 but unfortunately I take it for granted. I was raised in church a p. k. Mind you. I know he loves me otherwise I would not be here. He has protected me from an abusive relationship to where I tried to kill myself just to get away from the relationship yet to find myself going back. God loved me enough to see me through it and help me escape yet I still have backslide from him. He brings me through so much yet I still find myself not in church. I know happiness in life comes through him and he loves me, I just don’t understand why I find it so hard to go to church. I use the excuse I don’t wanna go alone my family is all put of state my boyfriend is gone on weekends so I justify why. But today I find myself needing him needing his love wrapped around me. I got your post sent to me today from my mother . Wow god sends us what we need when we need it. He truly loves his children. I would say a 10, I have been protected in so many bad situations and I am continued to be protected, loved and blessed even though I have been flawed and didn’t deserve it in others eyes. I believe with all my heart that God Loves me, wish I could pick a number larger than 10..
What I think, What I like, What I know, What I want, What I see…..
On a scale from 1-10, sometimes a 10, other times a 5, I’ve been through many tragedies in my life, I lost one son at 14, before I lost him I got really close to God, when my son’s tragic accident happened, I knew why I had found God because I would definitely need him to survive, some people say what kind of God would do that to someone who believes and has faith, but I say what an awesome God that he would bring me to his throne, allow me to be forgiven for my unfaithfulness, and be by my side to comfort and hold me when I most needed him. Then it happened again this time to my 20 year old son, same thing a tragic accident, but this time I know God saw something in my son’s life that wasn’t good so he took him home, I pray for my family, my children, I put them in God’s hands and so if I do that I have to believe that what happens has a very trustable and worthy reason because I believe that God’s answers our prayers not always how we would like , but How he knows best. For me honestly it would have to be a 1, 0 if u had included it…i thought i knew, i mean really knew God loves me, maybe i do because i’m still alive now…i’m not writing this comment for the book, i just need your prayers. Last night i was close to taking my own life because of life and its endless challenges, i realized i could not handle it at all. So please keep me covered in your prayers, for peace and strength to keep going. Its hard most days not to think that God’s thoughts for us are above our understanding. so often I put human limitations and characteristics on Him. The only way to break this cycle is to go to Him, in prayer and read His words. Thanks for the reminder. The night I became a Christian it was because God said: “Come because I love you”, so I guess I’ve known for nearly 14 years. At the moment I’d be pretty high on the scale, but sometimes not. Circumstances can get to me and it’s tempting to question whether God cares, but I remember 1 Peter 5:7 and I know deep-down He does love me. Last night! Oh my stars! I’m so excited. You are loved. It is a fact. It is the truth. We can not depend on our feelings. We do not feel ourselves into right behavior and believing. We believe and behave into right feelings! Welcome to the family! Hi in my head an 8 but in my heart 3-5…would love this to grow. I would honestly have to say a 5 – I have a general peace that God love me, but human nature when bad things or stressful situations come about it makes you question the love. I thank God that I have outlets and encouragement from you, your site, family & friends in times of need to bring back to the fact that God loves me all the time and the struggles I may be facing are just tests that I must go through at that point and time, not punishment or lack of love from God….just times when I need to turn closer to him and trust in my faith. Most days I KNOW He loves me…other days I have to remind myself. But I never go through a single day without having some conversation with My Father about how much He loves HIs princess. Thank you for today’s reminder!!! 7 – I know God loves me. I see that played out all over my life….do I always live like I know God loves me? No. I forget and muddle on and then….He will do something to remind me. …a post like this, a hug from a friend, a brilliant sunrise that I got to see…yes, I know He loves me…I just need to remember it every day! I am going to say 6. I KNOW I am loved by God but sometimes I struggle to believe it. I have a strong desire to know it to the core of me and I pray often about it. I think I tend to forget it, or worse, feel like He has forgotten about me. We tried for a while to get pregnant and then when we did, the elation and thankfulness was so huge only to lose the pregnancy a few weeks later. I KNOW God is not hanging around just waiting to dash my hopes and dreams.I KNOW He has what is best for me, I KNOW He grieves with me too, and I even KNOW what I would have said to someone else in the same situation about His love. I want to trust Him more. The last two posts with photos of your son were bittersweet to me. They both fill me with sadness and also allow a little bit of hope to creep in for our future. I would have to say a 3 or 4 on a 10-point scale. This is actually a vast improvement over how I used to feel. We all know God loves the world, but it’s something entirely different when it takes on a personal meaning. This is something that I’ve been praying about lately, that God would show me how much He truly loves me-not just “the world,” but me personally. I would have to say a nine,I know that I am truly blessed by God’s unwavering love,no matter what is going on in my life. I know that His love is steadfast,and that is the greatest blessing of all! I have enjoyed reading your posts for a while now, thank you for providing me with spiritual food for thought, it is appriciated and at times, very much needed! I know that God loves me in my head, but I don’t think that it has reached my heart. I know that God is love and that He forgives us when we do wrong, but it just seems that my life sometimes is filled with doing the wrong things. I know that He doesn’t stop loving me because of it. He loves the sinner but He hates the sin. In my heart of hearts I know it’s a 10 but some days I forget. It’s always great to be reminded. Thank you! With overflowing joy and gratitude, I respond with a big 10. through this article, I hear God speaking sweetly and clearly to me. As I awake each day, I know, and am even more assured, that God loves me exceedingly more than I could ever imagine, and this love is unchanging through the good times and the bad. If He doesn’t, I would not have been able to shout it out to the world at this very moment. Honestly, a say a 2! Sometimes I get depresssed and don’t feel loved. I am thankful that His love is neverending and that He is faithful. Sharon your words today touched on exactly how I have been feeling all week. It’s true, sometimes we all just need to feel like we are seen and matter to people. I know I am loved by God because he knows I love him he said it and I believe it and so ends it!!! I would say a 5…its really hard when your whole life youve struggled with who you are and what your purpose is and the whole way the world has lied to you.I am thankful that little by little Im coming to know how much he does love me!!!! Deuteronomy 33: 26, 27 “There is no one like the God of Jeshurun, Who rides the heavens to help you, And in His excellency on the clouds. 27 The eternal God is your refuge, And underneath are the everlasting arms; He will thrust out the enemy from before you, And will say, “Destroy!” Keep your eyes, heart and mind fixed on Jesus and CLING! That is my word for 2013! 🙂 God bless you richly! Greetings from Mexico. I read your devotion this morning, from how I feel this mornng from a scale of 1-10, I feel right now a 1 but I know He loves me a 10. Am going through a season right now and it is not a easy one, but you have helped me to realize that I have some who loves me, who is by my side. Thank you. God continue to bless you. I know God loves me through answered prayers that is so evident in my life. Again and again, He shows me by the miracles in my days. Sometimes I don’t even ask Him out loud, I just think of it and He gives it to me. Inspite of all the things I go though whether it’s a challenge, a hurt, a disappointment, a pain or a problem, I know He will help me with it. He showers me with love that I can’t understand sometimes. I feel content and happy knowing that I have Him on my side. Praise the Lord that I am His child and that I have my salvation first and foremost. Thank you for your devotion today. I will try to but I don’t think you get mine for some reason because they never show up when I go on again. But, here goes. I believe that God loves me more than what I give him credit for. For over ten years I have been praying for my daughter who ran away and was put with her father, my ex-husband (whom I had to divorce because he tried to drown me, )but that’s a whole other story. Up until last week when we had a guest preacher I believed that God didn’t love me enough because he wasn’t answering my prayers for so long. But when I listened to his sermon I was finally freed from the hold the devil had on me believing the lies that God didn’t care about me or my daughter, who is know 26 years old. I have a peace that surpasses all understanding in me now and I am grateful for that. He hasn’t changed my relationship with my daughter, she still doesn’t speak to me but he has changed me and now I am filled with joy. Praise God, Joanie! Thank you so much for sharing this with us. It is wonderful that you have a peace that passes understanding, you are thankful and filled with joy! That will be contagious and you can share it and comfort others. I appreciate your statement “I believe that God loves me more than what I give Him credit for.” Whew! This is probably true for the majority of us. May we all be give God much more credit than we are in the habit of giving. His love for us is so great and deep! All glory, praise and honor to Him! God bless you richly! Honestly I would say a 3. Even though I believe that God loves me like it says in His word, it’s hard to accept it. When you have been told all your life basically that your nothing, ugly and so on and have not been loved and accepted by those who you thought would automatically love and accept you it’s hard to believe that God loves you that much and sees good in you. In a nut shell it’s hard to accept love when you don’t love yourself but I am working each day to love and accept myself the way I know deep down inside God loves me. Thank you for the opportunity to win your book. I so enjoy your writings on Girlfriends in God. I am certain of God’s love for me. He cared enough to send his only son to save me. Couldn’t be more certain than that so I’d give it a 10! We must always remind ourselves of this fact. It’s easier for me to show compassion and gentleness to others than it is myself. I’m not quite sure of the reason for this….I guess I’m harder on myself than I am others! I need to work on my self love! I know God loves me because when I was at the lowest point in my life, desperate, hopeless & did not want to live..He lifted me up out of that despair. I tried to commit suicide..took enough pills to kill an elephant (so I was told) was completely out of it for the whole weekend. Nothing was done, no one was called, I didn’t have my stomach pumped & I got up that Monday & went to work. God’s grace Oh Yes God’s love most definitely. For years I needed to settle it in my heart the Love God has for me. For me, 8. I am alive by His grace and Mercy. God has provided, protected, saved me from myself and yes there are times I question His love. But I know His love runs deep and is the only reason I am here! I know that God loves me because He says so in His word but I want to experience more and more of His love in my spirit. I am working on it I get lazy because of my chronic condition at times but I keep searching the scriptures, doing bible study, prayer, encouraging devotions like yours and others. I experience God’s love and presence on a daily basis through the littlest things ans some big. My head tells me God is real but my heart needs help. 4. My head hasn’t told my heart. I know that God loves me, but I do struggle with my relationship with him because of the tense relationship I had with my earthly father. Working on it! Thanks for your encouragement through your blog, books, etc. There are moments when I’m not certain of my awareness of good’s love. My interactions with people usually tell me. I can get highly irritated with every little action someone makes, especially my daughter, and when I’m aware that I’m in this state, I ask for His presence and usually it is then that I realize my love comes from Him. Most of the time tho I know for sure because of the darkness and existence from the deepest pit is no longer a way of life for me. I know I am loved by God. Learning each day how to connect more closely with Him. Definitely a 10. I am so grateful that He is always near and answers prayers. Maybe not exactly when or what, but always what is best. He has opened my eyes to blessings and miracles this year that I never would have imagined but it was what I needed. Praise God continuously. I used to feel God didn’t love me, there was always someone more important when I read about the 99 sheep the shepherd would leave to find the one lost sheep. I felt the lost sjheep was so important he would abandon me to get that one. Then I saw that he makes sure the 99 are safe and protected before leaving. He does love me! He does protect me! He knows my name and needs and cares for me. I know that God loves me unconditionally. I am still always failing Him and falling short. Loved finding your site today. It is the reminder I need to make it through today. I have had some difficulty “seeing” God’s love for me this year with many personal attacks from a daughter who is an addict. I have wasted so much this year grieving and listening to the lies of the enemy. I appreciate GIG and the truth you ladies share. I am now walking forward, working to understand how He can love me soo much when I have not been faithful to him. Blessings! Lately my feelings about God’s love change daily. Since my husbands diagnosis of cancer back in March of this year, complications from his surgery and just last week hearing that the cancer has returned and that he needs to repeat the same operation all over again. I am afraid. I pray and ask God for answers and to show me his plan. deep down I know he won’t, but I need to know what the future holds. I do hav e good days where God’s love flows deep inside me, then I have days where i feel only a sprinkle. What I KNOW and what I choose to THINK on CONTINUOUSLY are two different things 😉 On a scale of 1-10, I know WITHOUT a doubt (10+) that God UNconditionally loves me SO much…. I need to think of this TRUTH more often! Thank you for the reminder. THE TRUTH ALWAYS is more important and rules over our humanly thoughts…With that being said: I must TAKE EVERY thought captive to the obedience of Christ! I know God loves me because He said so and He showed it, when He died on the cross. This is something I’ve really been dealing with lately how much God loves me and what can I do for Him? I pray to be failthful and obedient. God’s love is unconditional and constant and how thankful I am for that. He doesn’t push me to the curb when I fall or fail. Thats the love of God! My immediate thought was 7. I do know He loves me dearly – untiringly, unconditionally, and so much more; often I don’t act like it. 🙁 I am dealing with issues with my 16 year old daughter and it isn’t easy. I think I should be able to pull myself up by my bootstraps and remind myself who I am in Christ and Who He is in me. Too often I run to food. I want to run quickly to God instead and taste and see that HE IS GOOD!! 🙂 Praise Him for His unrelenting love! I know without a doubt that God loves me. I am learning how much and how to accept Gods love daily. Thank you for reminding me one more time how much God loves me. He is my Daddy when my earthly father was never there for me. He is my husband when my husband left. He is the Father of my kids. A 10 only because He loves me beyond my comprehension. He saved me from destruction and gave me life to live in Christ. It’s not always easy but I continue daily to seek Him in every area of my life. All praise to God. 10 definitely! To think otherwise would diminish what Christ accomplished through his death, burial and resurrection. To God be the glory. I actually learned of God’s agape love when I first held my newborn adopted son. I was unable to have children and here I was holding an almost 5 lb newborn precious baby and God spoke to me so deeply that day. He said look at this child, he doesnt know you, he’s never done anything for you, he’s only been in the world a few hours but yet you would die for him right now. This is how I feel about you, you could never do anything to earn my love, or to lose my love. That was a HUGE turning point in my life, he truly freed me from the living guilty every time I felt like I did something wrong, beating myself up more than I was living for God. I definitely know God loves me (10 x 10). He’s too good to me. I’m his favorite child. He’s done so much for me. I feel so blessed. I feel a 10 🙂 My family has definitely been blessed, especially recently. 10…I know God loves me because he has put that love in my heart, the desire to be with him everyday and to obey Him in loving others. I’m still working on it. Sometimes I feel like I have to “earn” God’s love. Although I know it isn’t true, my emotional self isn’t quite there yet. How can someone like Him love someone like me?? I know God loves me it’s a 10. He gives me Bible verses and songs thought out the day. His presence is always with me. I say 10, because the bible tells me so. I know his word is Truth! I accepted Jesus at an early age of 11-13. I actually found where I had written asking for Jesus to forgive me and accept me! I at this young age by myself would search out churches. Truly I understand what I was doing for sure. I do believe I knew Jesus was always with me, and as I look back through many very difficult times he allowed these things, but it always could have been worse. God doesn’t Break his Promises! I am now 51 and I definitely know God loves me, my problem is loving myself. I have come a very long way and The Lord has taught me many lessons that have made me a better person. When I go into tough times now, I draw even closer to God. I have learned that people, all of us are sinners, we mess up. I will be hurt by a sinner. But it helps me to understand and forgive because I am a sinner. But God/Jesus is not. Jesus promised along time ago He would never leave me nor forsake me, and I can say he never has. It’s me that disappoints, but I ask forgiveness and move on. Yes I believe God loves me 100% ……. Sorry I need edit button. I wanted to add to my comment that I didn’t understand. And where I had written asking Jesus for forgiveness was in the back of a bible my Gram Scott gave me in 1971, I was 10 years old. My parents did not attend church. My Gram was very special and taught me how important it was to have God. I still have that Bible!…. I have every number on the scale at one time or another throughout my life….But I know my God loves me….God has used many of your books to reach me…God bless you! Yes I’ve read a few books to inspire me to learn more about God. I truly believe every good thing comes from God. He loves me so much and gives me mercies that I don’t deserve and I’m not worthy. Being on the back side of this life, I can say with much confidence and expectation that my God, my Yahweh, loves me and cares for me…….He is listening closely to every word that I say to Him, ….every detail and nothing….NOTHING is impossible for Him!!!!!!! I know that he loves me and the love I have for my children reminds me that it is only a portion of God’s love for me. At times when I am burden He shows up with unexpected blessings. I do feel, however, that for some reason there is a void when I try to pray now. I know he is listening but I miss getting in that holy place where I just feel hs presence in the Holy of Holies. On a scale of 1 to 10 a 10 I know that God loves me because He has been with me during my caring for my Dad in 2008 until he passed from terminal bladder cancer, He provided me with strength and courage and His love and grace to share with my co-workers when I was going through chemo treatments for breast cancer and now He provides me with patience and compassion to care of my Mom who has terminal breast cancer. Through past times and present day He has provided me with strength, courage, peace and joy. I am not afraid of what the future may hold because I know I am not alone. That I am loved. I would have to say that it depends on my circumstances.. though selfish, when things are going well and life is good I feel sure that God loves me . When I’m in the pit, I sometimes wonder if he loves me at all. To best answer this question, I would say my head knowledge would rate at 4 or five, but in my heart, I know the truth and would give myself a 10. Lord help my unbelief. Sometimes it’s really hard to remember that he loves me. This is something I struggle with daily. I am constantly looking for acceptance and go by feelings a lot. I would say a 4. I wish I was more confident in His love for me despite me failing every day in my walk with him. I will never be satisfied until I wake in His likeness. .In my head I think I am 7 or 8, but that can vary based upon the influences of daily life. But I sometimes struggle to merge the knowledge in my head with the feelings in my heart, so some days I feel I’m at 4 or 5. It’s hard to understand how he really has time to devote to me with all the distractions he has of loving and guiding millions of people. I loved your blog, many times I feel overwhelmed by God’s love and know I rate at least a 9 on your scale, other times when I am feeling hurt or am in pain I wonder where my God of love is and feel much lower. Have you ever read the book called The Shack? It gives you a whole new insight on how to view God. Most days I feel 8 but I’ve only been a true believer for about 3 1/2 years and so I’m learning every day how much He loves me. I guess the right answer should be 10 but I still have alot of learning to do in this department. However, I truly LOVE learning that someone loves me no matter what! You know what? I’m loving him too. 10! I know God loves me without any doubt. I love others with a heart like King Jesus. But, I like many need to learn to love myself! I know in my heart that he loves me but I find myself so often seeking his approval and acceptance. Thank you for sharing God’s word and his promises. How do I know God loves me. If I had to put a number it would have to be 10. There is No way I could get through even the smallest task or issue I face without him. As a woman, wife , mother, grandmother, employee, teacher and leader of children in my church. Life presents many challenges to me daily. Without his loving and guiding hand over me I would be a total basket case. He loves me by providing calmness, when confronted by angry and frustrated people, when my children (although grown) come with life’s problems and issues. When my grandchildren become disobedient and disrespectful. When my husband comes in from a terrible day at work, or the kids at Church want to be more than of a handful. Or when a friend whose whole world is shattered or shattering. Knowing I can go to him and just say please help and he Is there. When I ask for the right frame of mind to listen. When I ask for strength to deal with hard people, or wisdom to know when to speak and when not to. Gods does all this and so much more. You don’t have enough space for me to list. I don’t want to even think of my life without his love. I can’t imagine and don’t want to imagine life without him. When I first read that question – I honestly answered 8 or 9 but I know it is a 10! God has performed miracles – starting with my husband finding a job. I have been praying for those sisters who are going through difficult times and answering 2 or 4….and I believe “If God leads you to it, He will lead you through it!” I was lamenting to God one day, reminding Him of the endless hospital bills we are paying off, and the mortgage, and my husband’s medication which we had to charge on an ever increasing credit card bill because we are “making too much money” to get assistance with my 2 part time jobs, and I came across this Isaiah 30:18 “Yet the Lord is waiting to show you favor, and he rises to pity you; For the Lord is a God of justice: blessed are all who wait for him!” And then my husband was accepted by the hospital’s free medication program and he will be eligible for benefits in October, but we are managing now. AMEN! The Lord is waiting to show you, each of you who have replied with a 2 or 1 or even zero. A 10 – I am so grateful that God loves me and for His great mercy that is new everyday! In my head I know I am supposed to believe I am an 8 or 9 but I struggle in my heart with not being worthy. Right now I am about a 2. 10!! I know I am loved by reading His promises in the bible. I’m so thankful for his love, compassion and mercy that He shows me everyday! Just thinking of His love makes me want to holler! PRAISE JESUS!! I know God loves me unconditionally and I experience his love almost daily in sudden glory kindness when I know he is there with me. I feel like I am a 9 but pay daily for my spiritual growth with him to continue to grow to a 10+. I know God loves me. But it’s something I have to repeatedly remind myself of. It’s so much harder for me to love myself. I’m so grateful that God knows my heart and relates to me personally. I beat myself up with careless things I say and do. Perfection is my enemy. Sometimes I think God must have a hard time loving me, but thankfully I can lean on the scriptures and know that I know that I KNOW that He does. I know God loves me but the #s wobble…sometimes my faith wavers some….so I would say a 8-10 on days….today is a 10 …God is good and does watch out for me…I just get impatient at times. My precious little grandson passed away a couple of months ago. He was a few days shy of his seventh birthday. From the day he was born, I knew God had great plans for him. It’s sometimes hard to understand His plans and I sometimes feel as if He has turned His head, but I know He is there and I know He loves me. I know God’s love is always a 10, but I don’t always feel like I deserve it, which makes the answer to that question dependent on the day. This is where my trouble lies. I base His love on my actions and I know that is not true. He loves me absolutely. I know because everyday he shows be in little ways that are big to me. i must say to you and Girl friends in God, you are a huge blessing and encouragement to me each day. i look forward each week to reading your hands on no pretense accounts of your journeys in faith. May God continue to strengthen and replenish you. Your baby story was so precious to me, as the birth of my first child was the way that God communicated to me of His love. I had spent years struggling with trying to find assurance of His love, asking Him to save me every Sunday! I even had a nightmare that plagued me where God threw me out of Heaven because I wasn’t good enough! When my daughter was born and I felt overwhelming, unconditional love for her, God spoke to my heart and showed me that He loved me that same way. The nightmare never returned. I have had assurance ever since that day. How freeing to know that you are loved! Amen. I’m about a 6 or 7. I know that he LOVES me, but sometimes I feel that he not there, or he not listen to me and I know that it not true I really know he loves me and listens to every word and thought that I have. But there something just missing in a part of me its like I cant get what he says to me, it like I’am I know he there but why can’t I get it… I get frustrated at myself, cause I want a more intimacy relationship with GOD than I have ever experienced before. and I can’t fine myself getting there I don’t understand what is stopping me from that intimacy with him. So I keep searching my heart and intersoul that one day soon I will really find that Intimacy with him.. Thank you Sharon for letting me share this with you.. I know that God loves me today because I responded to Jesus’s call and accepted Him into my life. Through all my years trying to walk close to Him and being obedient to Him I know I have failed Him many times. I know even stronger that every time I turned to Him He was always there with open arms waiting for me. How many times I have asked Him:”why do you love me?” And deep in my heart I just knew He was pleased and happy with me when I stood in His Presence. He continually makes me whole as I walk through this life and one day I will know and understand His plan for mankind. For today I truly live by Faith, Faith in Him and all that He is.